If you have multiple pop-up ads appearing on your browser’s window whenever you access online shopping malls, you should check whether you have Lampy Lighty installed on your PC. It is an adware application, and it clearly collects data on what websites you visit and what you search for online. It is not an illegal activity, but it would not be good if it got leaked to affiliated third parties. If you care about your system’s security and your privacy, you will remove Lampy Lighty from your PC immediately. Please scroll down to the bottom for manual removal instructions. For the most part, users often do not even realize that they downloaded and installed Lampy Lighty on their computers themselves. It happens because this application gets distributed bundled with other freeware applications. Most of the time, the installer files for freeware apps are hosted at third-party file sharing websites. Whenever you download something at a third-party website, you need to be sure that the program you are about to install does not have any additional (most probably unnecessary) features. One of those additional applications might just be Lampy Lighty. Even though Lampy Lighty has a homepage at lampylighty.com, there is nothing useful there. All adware applications from the SuperWeb family are known to have homepages, but the direct download links there are dead, and our security experts believe that there were no direct download links to begin with. Just like Spark Cast, Box Rock, or Platamoose, Lampy Lighty travels around together with other potentially unwanted applications. Hence, if you allow one unreliable program to enter your PC, it is very likely that there is an entire horde of other applications waiting behind its back. 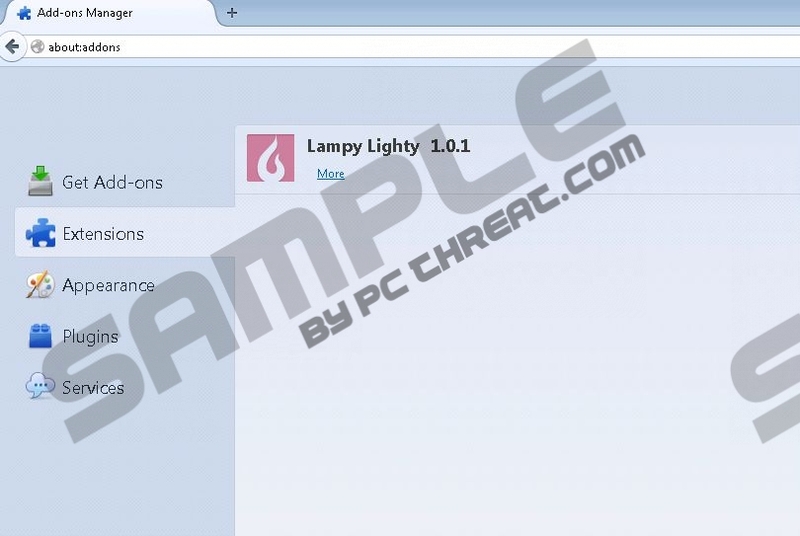 Once Lampy Lighty enters your PC, it adds extensions to Google Chrome, Mozilla Firefox, and Internet Explorer web browsers. As has been mentioned above, Lampy Lighty collects data on what websites you visit. With this collected information Lampy Lighty generates your online profile, and, consequently, it is able to create a series of commercial ads that contain relevant content. The content is obviously related to your latest web search queries, so it may seem that Lampy Lighty really wants to help you find something you have been searching for. Never click ads from Lampy Lighty or any other adware application, because they are not reliable. You need to delete Lampy Lighty from your computer if you want to avoid potential security issues. When you terminate this application, scan the PC in search of other unwanted programs. Also, do not forget that the best way to ensure your system’s security is installing in a licensed antispyware tool. Open Uninstall a program and remove Lampy Lighty. Go to Uninstall a program and remove Lampy Lighty. Select Add or remove programs and uninstall Lampy Lighty. Should you have any further questions regarding Lampy Lighty or its removal, do not hesitate to leave us a comment in the box below this description. Quick & tested solution for Lampy Lighty removal.